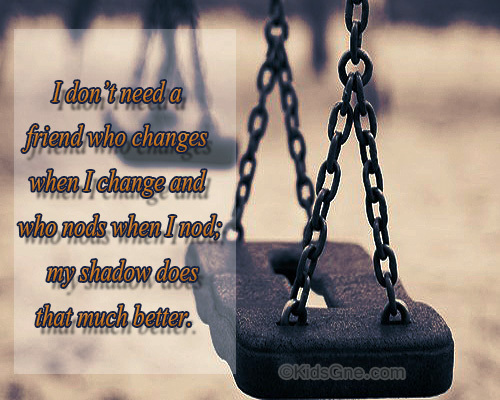 Below is a collection of friendship quotes. Read them, and you can also copy them for use with a greeting card.You can also click here to submit your friendship quotes. We will publish it with your credits. Send these Quotes to friend now! "A friend is one who knows us, but loves us anyway." 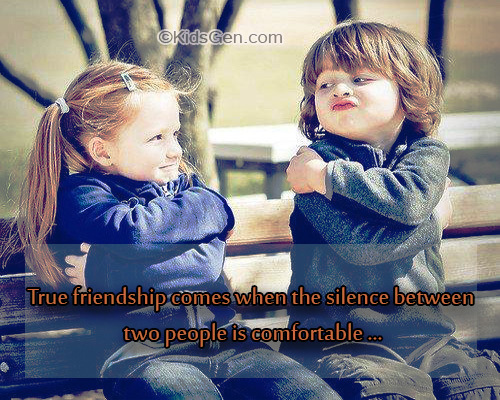 "What is a friend? I will tell you...it is someone with whom you dare to be yourself." "All love that has not friendship for its base, is like a mansion built upon the sand." "Your friends will know you better in the first minute they meet you than your acquaintances will know you in a thousand years." "Can miles truly separate us from friends? If we want to be with someone we love, aren't we already there?" "A part of you has grown in me. And so you see, it's you and me together forever and never apart, maybe in distance, but never in heart." "A friend is someone who reaches out for your hand...and touches your heart." "...no man is useless while he has a friend." "Well, it seems to me that the best relationships--the ones that last-- are frequently the ones that are rooted in friendship. You know, one day you look at the person and you see something more than you did the night before. Like a switch has been flicked somewhere. And the person who was just a friend is...suddenly the only person you can ever imagine yourself with." "No love, no friendship can cross the path of our destiny without leaving some kind of mark on it forever." "When a friend's in trouble, don't insult him by asking what you can do, think for yourself and start doing it." I thank God for the way he made you, distinct, special and unique. You were not made from a common mold. Blessed are they who have the gift of making friends, for it is one of God's greatest gifts. It involves many things, but above all the power of going out of one's self and appreciating what is noble and loving in another. in spite of distances or thoughts expressed That can make life a garden." "Silence is the true friend that never betrays." "Don't walk in front of me, I may not follow ~ Don't walk behind me, I may not lead ~ Just walk beside me and be my friend." Building a friendship is like planting a quote. "An ounce of blood is worth more than a pound of friendship." "Hold a true friend with both your hands." "There comes that mysterious meeting in life when someone acknowledges who we are and what we can be, igniting the circuits of our highest potential." Prepare yourself and follow me." "A brother is not always a friend, but a friend is always a brother." "Never hurt your friends, not even in a joke." "A friendship that stops existing, was actually never there." "Hold on to your friend with both hands." "He who searches for friends without faults, will never have a friend." "You will never have a perfect friendship, but you must strive for one." "A person who has no friends, lives only half way." "Be careful of what you say, friendship can end in one minute because of a stupid word." 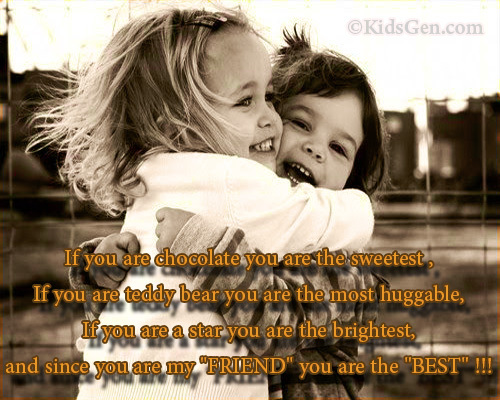 "Friends are the chocolate chips in the cookie of life." "Friends are the angels who lift us to our feet when our wings have trouble remembering how to fly." "Wherever you may be it is your friends who make your world." "I always knew looking back on the tears would make me laugh. But I never knew looking back on the laughs would make me cry." "A hedge between keeps friendship green." "God defend me from my friends; from my enemies I can defend myself." "The best of friends must part." "The death of a friend is equivalent to the loss of a limb." "Life without a friend is like death without a witness." "Friendship that flows from the heart cannot be frozen by adversity, as the water that flows from the spring cannot congeal in winter." Where there are friends, there is wealth. Few delights can equal the mere presence of someone we utterly trust.